Hey! Microdungeons.com was featured on the MAKE blog, thanks to John at MAKE! To celebrate, I'm posting tomorrow's dungeon early! Sir Kond lies in state in the Town Hall and his house, Manse Kond, stands empty for the first time in a century. They say that alive, the Baron treated with monsters, that he poisoned his one true love, and that his wealth is buried in a hidden mine beneath Manse Hill. Then again, perhaps he was just the lonely, bitter man he always appeared. But if so, what was the fate of Lady Kond, and where is his fabulous treasure? The answers surely lie beneath the manse by the sea. 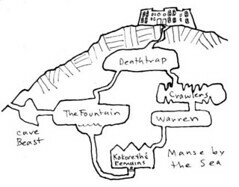 Somehow you've got the correct microdungeon thumbnail showing up, but it's linking to the Thelon's Rift picture on Flickr. Weird... it's fixed now. Flickr-to-Blogger doesn't support post scheduling, so I was messing around with the HTML manually, to my detriment. very cool stuff, thanks for sharing these!